Part of a chain of orienteering maps in the Teanaway Community Forest, Lick Creek is rugged, challenging, and beautiful. There is a ton of contour details and large areas without trails, making this one of Cascade’s most challenging and rewarding maps to navigate. Vegetation becomes quickly outdated here, so do not rely on vegetation alone; contours are your best friend! Lick Creek is rugged and moderately hilly, with some especially steep areas that nice course designers try to avoid. Deadfall on the ground makes running or hiking more strenuous. There is a lot of contour details on the Lick Creek map. There are prominent ridges, but then also many small spurs and re-entrants coming off of these. 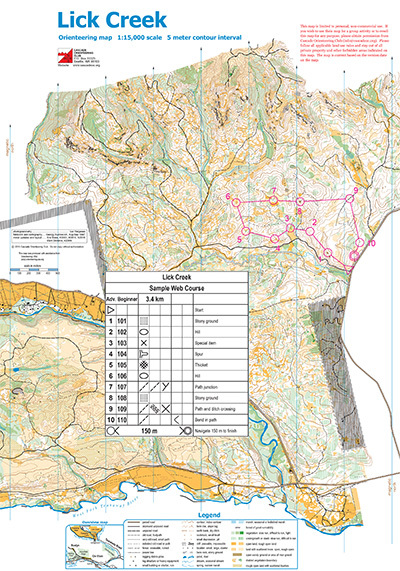 Combined with large areas without trails, this is one of Cascade’s most challenging and rewarding maps to navigate. The map also contains detailed vegetation information, but vegetation becomes quickly outdated in this area due to both growth and logging. 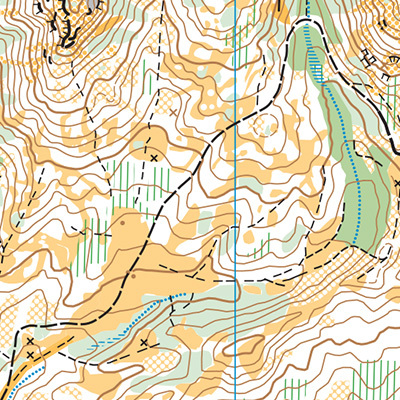 Do not rely on vegetation alone; contours are your best friend! While there are large trails and prominent ridges to help keep you from getting completely lost, new orienteers should consider choosing a shorter or easier course than usual. Lick Creek is rugged and moderately hilly, with some especially steep areas that nice course designers try to avoid. Lick Creek is typically used for longer events, and participants should consider carrying water and snacks on the course. Please watch carefully for competitors that may be walking or running along the road!